TAC Bilişim Hizmetleri İç ve Dış Ticaret A.Ş. CONIG® (Converged Information Governance) is a governance framework developed by TAC A.S. addressing information and related technologies. Its main focus is INFORMATION. CONIG® is based on models that are widely used for Information Technologies, Corporate Governance as well as Business Governance. Introduced in 2009 by TAC A.S., CONIG® is a reference framework that consists of components of various models, best-practices, framework and standards. All of the underlying frameworks and best practices are widely accepted in the industry. While they might bring different perspectives and differ in nuances the common goal of all these frameworks and best practices is the assurance of provisioning of IT services, business services, and other enabler services. CONIG® aims to find the right balance between internal control approach focusing on control objectives and performance management approach focusing on achievement of value targets for the organization. It aims effective and efficient utilization of service and customer focused resources and capabilities to ensure that the IT organizations’ activities are aligned with business objectives. It ensures that desired quality, security and compliance requirements of produced and offered services are met. 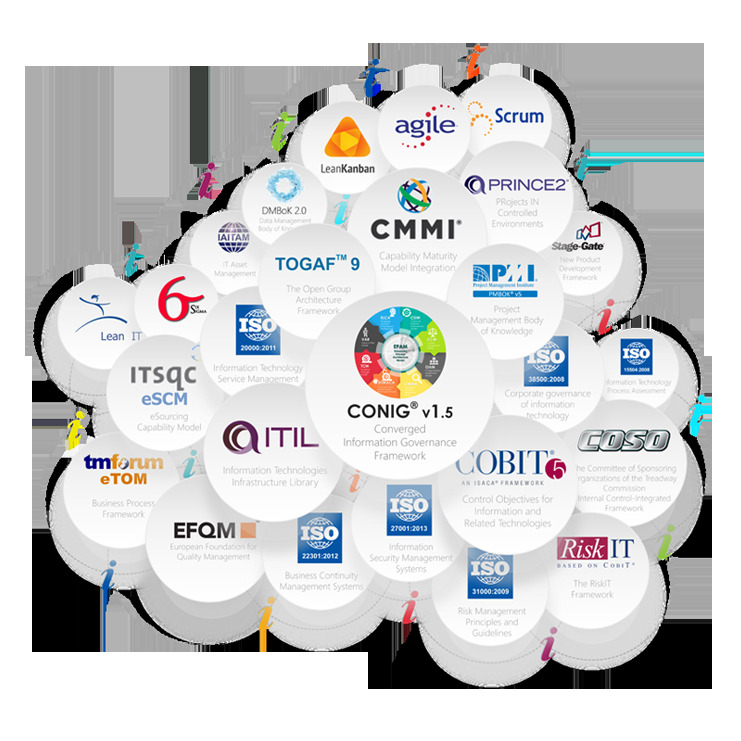 In general the purpose of CONIG is providing processes, structures and other related models to govern and manage the lifecycles of IT resources and capabilities of an organization to provide IT services to its clients at an acceptable level of cost and resource utilization. At the core of CONIG® has PROCESS and IT SERVICE approach. CONIG® defines INFORMATION as a valuable ASSET for the business. It is based on IT Services and provides a MANAGEMENT SYSTEM FRAMEWORK that includes MODELS consisting of PROCESSES for the governance and management of TECHNOLOGY based IT Services that are used for storing, processing, communicating and utilization of this INFORMATION.